Christmas garland is one of those decorations that ties a look together, filling out a lot of space with beautiful greenery and serving as a platform for lights or other ornaments. This type of decor is a natural complement to trees and is available in dozens of artificial forms, like firs, pines or spruces. Sophisticated artificial versions are practically indistinguishable from natural versions, which have become increasingly difficult to find. Over the years, people have come to realize how frustrating it can be to string needle-dropping branches throughout the home. Artificial decorations obviously don’t suffer from this problem, and they also don’t release allergens or discolor as they age. In short, they are the perfect decoration for the discerning homeowner that wants beauty without any of the hassle. What purpose has Christmas garland served in history? Holiday greenery has a long tradition and dates back to winter solstice celebrations. Although it goes unnoticed for most people now, the winter solstice was once a significant event for peoples around the world. As the shortest day of the year, the winter solstice was often met with unease, and people would remind themselves of the cyclical nature of the seasons by decorating their homes with evergreen, as it symbolized the idea of perseverance through the winter. When the first settlers arrived in what would become the U.S., they brought Christmas garland with them. Around the holidays, families looking to make a little extra money would take the branches of firs, pines or spruces and twist them until they became flexible, shapeable decorations. Families would then sell them to neighbors or villagers, helping them bring in a little extra income during the lean months. So, you might say that the tradition of working long hours for additional holiday funds dates back to the origins of the country. 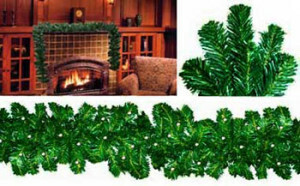 What kinds of Christmas garland can be used for decoration? Artificial decorations offer a level of convenience and function that can’t be found in their natural counterparts. For example, artificial decorations can be integrated with holiday lights of any type, though simple, warm white lights are often the best choice. The wiring is wound tight around the branch, so you don’t have to fuss with cables all over the place, which is useful for avoiding any type of eyesore. Artificial garland will help minimize the mess and clutter, allowing the homeowner to focus on the way it accentuates the home and the season. Artificial decorations are also made with a consistent level of quality. Nature is beautiful in many ways, but it hasn’t standardized its manufacturing processes, so it can be tough to find natural decorations that look and feel the same. Artificial designs are produced with a similar look, so they can be strung for hundreds of feet without any part of the strand looking odd or out of place. No home should be without these decorations during the holidays. They are one of the oldest traditions in America and remind us that warmth and happiness are possible even during the cold twilight of winter. What New Ways Can Christmas Garland Be Used For Holidays?